You are here: Home / Consumer Tips / How To Replace Your EcoWater Filter Cartridges On Reverse Osmosis Models, HERO 375, ERO 375E, ERO 375 & ERO 175. Please note that H2TO Water Treatment Inc. is an authorized EcoWater Systems® dealer. Replacing the pre filter and post filter on your EcoWater Systems® reverse osmosis is the essential part of maintaining the product. As per manufactures recommendation if water supplies containing both sediment and chlorine the PRE filter cartridge should be replaced every 6 months. Changing the PRE filter often protect the RO membrane from being destroyed by chlorine and/or plugging from sediments. Step 1, Remove (turn to the left) the PRE filter cartridge from the filter head. Step 2, Remove (turn to the left) the POST filter cartridge from the filter head. 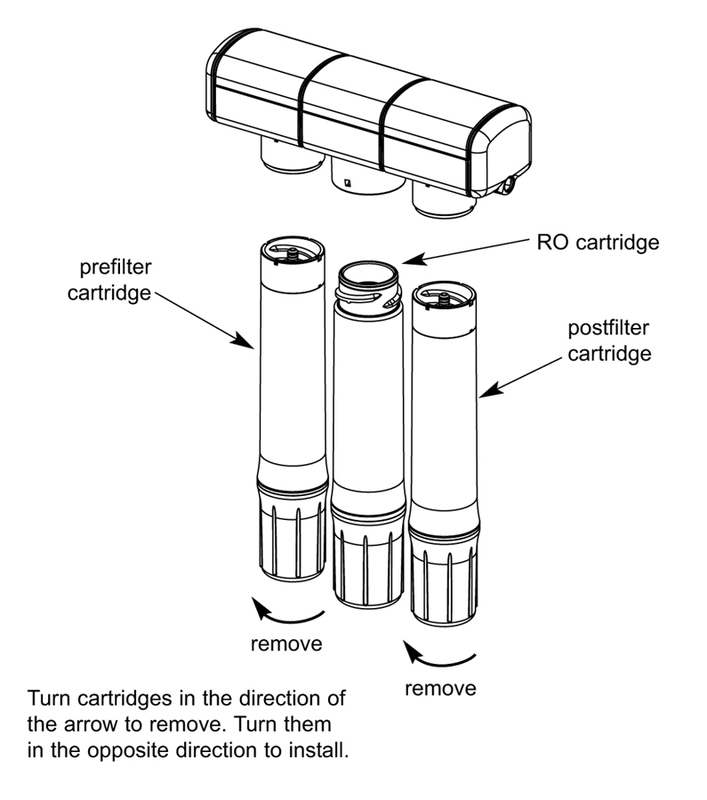 Step 4, Insert new cartridges, reattach (turning to the right) starting with the POST filter cartridge. Step 6, Models ERO 375E or HERO 375, press and hold the small black button until the green light begins to flash. (located on top of the manifold, under the cover) Release the button once flashing. Step 7, It is recommended to discard the first full tank of water after filters have been changed to minimize carbon fines. H2TO Water Treatment Inc. offers parts and service in and outside of our showroom, parts and filters can be delivered in Toronto and the GTA on any EcoWater Systems® products. We are also happy to go over these filter cartridge replacement (filter change) step by step with customers who choose to do the replacing of the filter cartridge themselves. We are not directly affiliated with any EcoWater dealer in the UK but I found this authorized dealers website https://ecowater-softeners.co.uk/ and hopefully they can be more helpful to you. Is the RO cartridge is the same as the membrane cartridge? cartridge replacement? How to set it? The Pre & Post filter are the same filter but the Pre is located Pre Membrane (untreated incoming water) and the Post is located Post Membrane (treated drinking supply water). The Membrane is different and is replaced less often. The system work on a timer or by usage for the amber light and quality of water for the red light. You can reset the system by opening the top lid of the manifold were you will see a small black button. Push and hold the button, a light next to that button will turn on and blink. Let go of the button once it blinks. It’s so interesting blog and i must appreciate your details about the alkaline water filter. We replaced the 2 filters and now the system doesn’t have any flow. Is it possible that the tank has lost pressure? Very detailed instructions. Thanks! Do you ship to California, USA? Hi There, we have a Ecowater drinking water system Ero 375. We need to replace the filter. Do we need to shut off the valve on the tank and also shut off the water valve before installing new filters? Also once the new filters are installed do we need to empty the water tank?